The Business and Finance niche is very rich and it is nice to find a lot of women topping the charts too. Gone are the days when business and finance is a man's world. I shared before how I started SavingsPinay. I got obsessed in reading personal finance book in National Bookstore. I read every page and got fascinated on how money works, how I can budget and save and how I can start investing in stock market. Another thing that helped me become better with money is my daily does of financial advise from women who are into personal finance too. 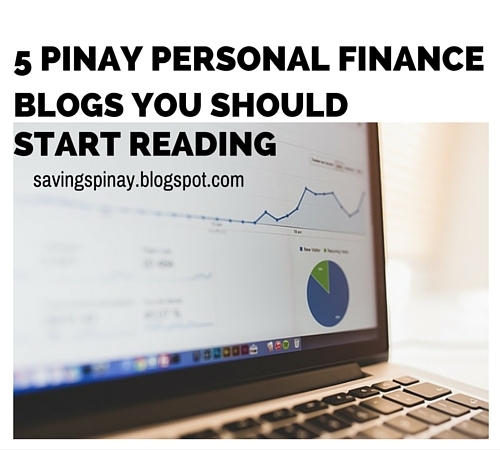 Today I'll be sharing 5 Pinay Personal Finance Blogs You Should Start Reading. I hope that you get motivated too to take control of your finances because of their intelligent insights. I've always been a big fan of Ms. Kristine. I have fun reading her beauty and fashion posts. But the inclusion of Money Matters is such a great decision. Through her I learned How to Invest in BDO UITF, What PNB UITF has to offer and more. Her Money Matters series will give you a lot of lessons from each article. Ms. Jill is such a big name when it comes to personal finance blogging. I love her blog so much and learned a lot from her journey to financial freedom. I am so happy for the new look of her blog too. I enjoy evertime she shares an income update and when she gives a personal rants/ramblings about budgeting and saving. I constantly read this blog and follow the journey of Ms. Maria Abellanosa, a former OFW who have now come home to the Philippines for good. I got inspired on how she manage to buy a house at a young age and how she started investing really young too. I also read her blog for frugal tips. Ms. Lianne's blog is something I followed since the beginning. She is so young yet so successful in her chosen career path. She is know a successful author, a registered financial planner and she shares her knowledge to help others achieve their goals. And did I mention that she's only 23? This is a new blog that I've been enjoying for the past couple of months. Ms. Cindy is so good when it comes to sharing her personal finance experience. I love that her blog is updated and that she shares random financial advice and rants on her portal. I always read her Life Update posts. Did you enjoy today's post? How to Budget Your Money For The Coming Holidays - New! 2 comments on "5 Pinay Personal Finance Blogs You Should Start Reading"